Castle® H-110 ™ has been formulated to aid the reduction of crosscontamination in hospitals and nursing homes. 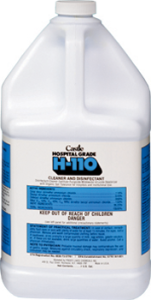 Castle® H-110™ is a one-step disinfectant-cleaner that is effective against a broad spectrum of bacteria. H-110™ is virucidal and fungicidal; when used as directed, it also inhibits the growth of mold and mildew and their odors. Castle® H-110™ will deodorize surfaces in toilet areas, behind and under sinks and counters, garbage cans and garbage storage areas, and other places where bacterial growth can cause malodors. 1. Follow instructions on bottle for specific uses.